The Marina Bay Sands integrated resort or Marina Bay IR is a development operated and managed by the leading casino developer, Las Vegas Sands - the same group responsible for the many of the world's hottest casino developments. This integrated resort is built with the objective of it being the premier entertainment destination, famous for its diversified range of attractions and facilities. The Marina Bay Sands IR was officially opened on 17 Feb 2011. Situated along the Marina Bay Waterfront, Marina Bay Sands Integrated Resort can be spotted from afar, from its distinct hotels bridged by the rooftop Sands SkyPark. Upon a closer look is an image so surreal that it almost feels like a scene out of a fairytale storybook. An artistically designed museum, a chain of high-end retail stores, world-class celebrity chef restaurants, theatre entertainment, snazzy nightlife and a bustling casino, will be the highlights of the Marina Bay Sands. The hotels also boast something uniquely different. The 2500 over rooms make up the three 57-storey towering hotels, which are artfully connected by a uniquely designed architecture that lets you get a panoramic view of the spectacular sights of Singapore. Known as Sands SkyPark, the rooftop landscape sits 200m in the sky, housing swimming pools, restaurants and bars, and decorated with rich lush greenery. Sands SkyPark tickets are sold at S$23/adult, S$17/child and S$20/senior citizen (aged 65 years and above). If you are a hotel's guest, you are allow to enter the Skypark free of charge with unlimited access and no time limit. As a guest, you can even bring your 'guests' to the Skypark as long as you are holding the valid hotel's room access card. There is no time limit as how long can the guests stay in the Skypark. Where to Buy Sands SkyPark Tickets? Visitors can purchase the tickets at the SkyPark Box Office located at B1 Hotel Tower 3. To be safe, as tickets could be sold out on any dates, Book the Skypark Tickes Online. For enquiry, call the ticketing hotline at +65 66888826. Wonder Full is one of the greatest outdoor light, music, water and sound show. It's a very entertaining and free show provided by Marina Bay Sands. Event Plaza at the Promenade (Waterfront of Marina Bay Sands). With the same developers behind the world's most popular casino destination, known as the "city that never sleeps", the Marina Bay Sands Casino promises to offer you world-class offerings, similar to that of what you'd find in Las Vegas. This will be the primary highlight for anyone who visits the Marina Bay IR, with the hopes of raising stakes, betting big and taking risks. 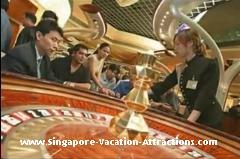 You'll find an array of the usual favourite table games of Blackjack, Baccarat, Roulette and others. With a total of up to 669 gaming tables and 1,500 slot machines, all made available to you 24 hours a day, seven days a week. Also tastefully designed, is the ArtScience museum that is crafted to look like a lotus flower, symbolizing a gesture of hospitality and welcome to visitors of the Marina Bay Sands Integrated Resort. The uniqueness of the exterior and artistic displays from various parts of the world would fill on-lookers with amazement and awe. In addition to that, is the interesting architecture with a roof that serves to channel rainwater right through to the centre of the building, passing off as a waterfall. With four floor of gallery space, cccupying a total area of 50,000 sq ft, the must-see exhibits are inside three rooms on the top floor. These rooms showcase the achievements of science and technology. The other three floors are reserved for special exhibits and will change every three to six monthes for new content. Even visitors with a business agenda have something to look forward to. Marina Bay Sands is the region's most business-focused Integrated Resort with its very own Sands Expo and Convention Centre. Built on 120,000 square meters of land space that can hold a capacity between 500 to 45,000 delegates, this will be Asia's venue for premium meetings, incentives, conventions and exhibitions. The Marina Bay Sands Grand Ballroom alone can host as many as thousands, and the meeting rooms can be easily tailored to suit groups of various sizes. Whatever the occasion may be, you'll find the business and convention facilities to be the perfect solution for you. And if that's not enough to feed your artistic senses, the theatrical entertainment should do the trick. One of the 2,000 seats theatres will be used for permanent performance. The other theatre is for concerts and roving shows. For more information on all the shows and events, please check out all events in Marina Bay Sands. End off your day with a gastronomical treat at any of the following celebrity chef restaurants only found at Marina Bay Sands Integrated Resort. Showcasing the culinary skills of specially selected chefs from different parts of the world, these will be dishes whipped up to satisfy your tummy, and ease your taste buds. Visit Restaurants in Marina Bay Sands for all sorts of restaurants which include cuisines of Chinese, American, Indian, Japanese, Italian, French, Modern Asian, Buffet, Hawker and local and Cafe, Bistro and Casual dining. A generous dose of retail therapy is also considered into the development of the Marina Bay Sands Integrated Resorts. With more than 300 retail shops and specially designated space for well-known luxury boutiques and fashion labels, The Shoppes are simply defined as a shopper's paradise. Never failing to showcase fashion's classics and the latest season's collection, this pavilion is just like a dream come true. The man-made canal was built in the basement level one of The Shoppe. A ride on the sampan takes about 10 mins. The ticket price for the boat ride is S$10 per person. Opening hours is from 11.30am to 8.30pm. Louis Vuitton Island Maison, which is the brand's first in South-east Asia, was officially opened on 18 Sep 2011. With four-storey and an area of 41,000 sq ft, the floating boutique has a bookstore selling art and design books, and also an exhibition of travel bags. The ground floor of the boutique offer a complete selection of men's and women's leather goods, shoes and accessories. It also has an underwater tunnel showcasing pieces of comtemporary art work. The two nightclubs were officially opened on 22 Sep 2011. Getting There: How to Get to Marina Bay Sands Integrated Resort? Visitors to Marina Bay Sands Integrated Resort can now take boat or water taxi to the resort. They may stop at any one of the two jetties. The North Jetty is located next to the ArtScience Museum. It will be used by water taxi operator Singapore River Cruise from today onwards. The other jetty, which is near to the Sands Expo and Convention Centre, will be used by another cruise operator Duck & Hippo by end of Oct 2011. There are total of 16 landing points along the Singapore River. Four of which are in Marina Bay: at the Esplanade-Theatres on the Bay, the Merlion Park, City Gallery and Clifford Pier. Other stops include Boat Quay, Clarke Quay and Robertson Quay. The charge by the Singapore River Cruise water taxi is at $4 for every jetty it stops at. As Marina Bay Sands is connected to the Bayfront MRT station, the easiest way to get there is by MRT(or Subway). Find out more on How to Get to Marina Bay Sands by MRT. Take a North-South Line MRT train to Marina Bay Station. Currently, there's only one exit. Once you are out of the station, you could see a junction on your right. Cross the road and walk along Central Boulevard. On the right there's a bus stop with services 133, 133M and 106 which will take you to Marina Bay Sands IR with just one stop. The car park at Marina Bay Sands Integrated Resort is located at Sands Expo and Convention Centre. You have to turn from Bayfront Ave into Bayfront link to access the car park. S$8 for the first hour, S$2 for the next subsequent 30 mins daily regardless of weekdays, weekends or public holidays. The maximum parking fees is capped at $28 per day. A standard charge of S$15 per day for guests staying at the hotel.